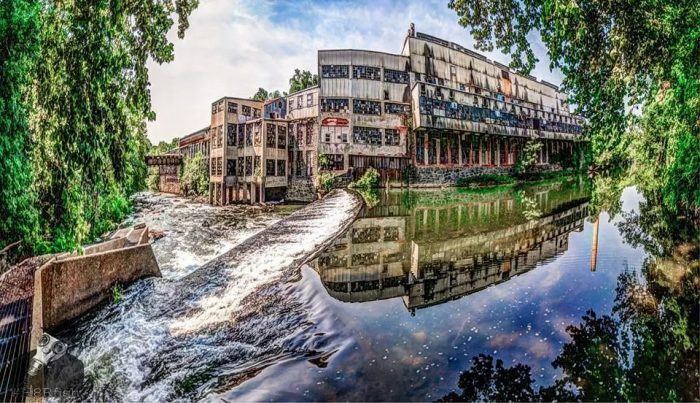 In 1787 the first paper mill, Gilpin’s Mill, opened in Delaware along the banks of the Brandywine Creek just north of Wilmington. 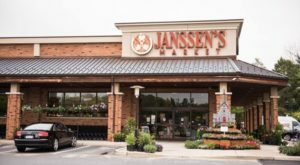 Decades later, in 1831, a textile company owned by an English immigrant named Joseph Bancroft opened on the same site. 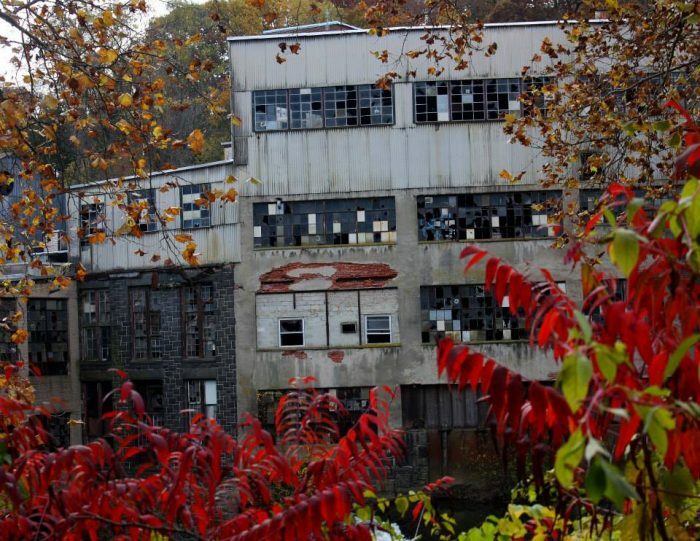 Bancroft Mills, which started in the original paper mill, expanded on the site until its closure in 1961. In the 1930s, it was considered to be one of the premier cotton finishing factories in the world. 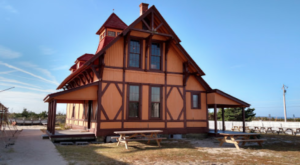 The Bancroft family was influential in the area and devoted much of their time to supporting the region, not just through industry. After changing hands in the 1960s, Wilmington Piece Dye company owned it until 2003, when it filed for bankruptcy. 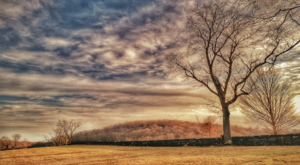 The property was then purchased with the intent to clean up the site and build luxury condominiums. 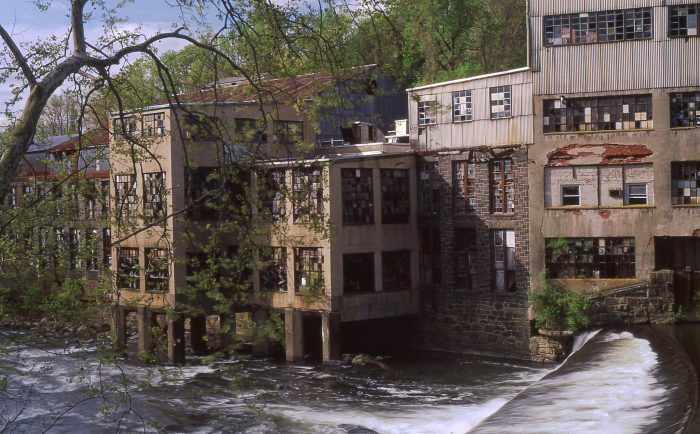 Two of the former buildings which comprised the mill were renovated and now are the site of 46 condominiums which back to the Brandywine River. 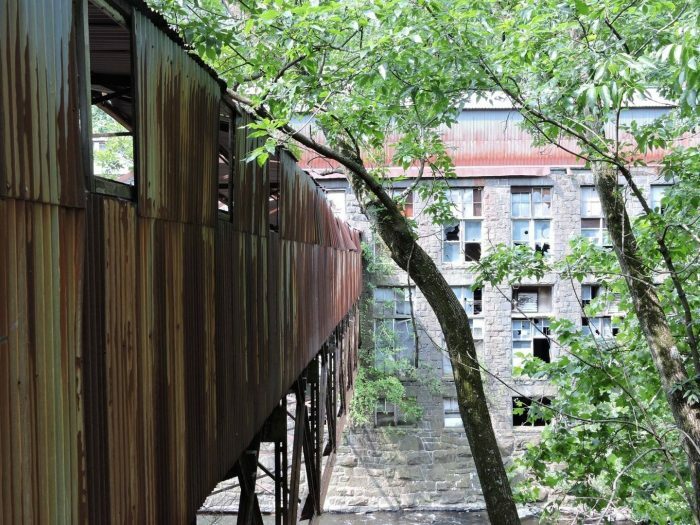 Bancroft Mills Condominiums prides itself on the historical nature of the site and has a fantastic history on its homeowners association website. 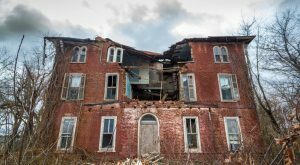 A fire in May of 2015 ripped through some of the still-abandoned buildings, leaving them in an even greater state of disrepair. One thing is for sure, though: the architectural beauty of this long forgotten place is amazing. 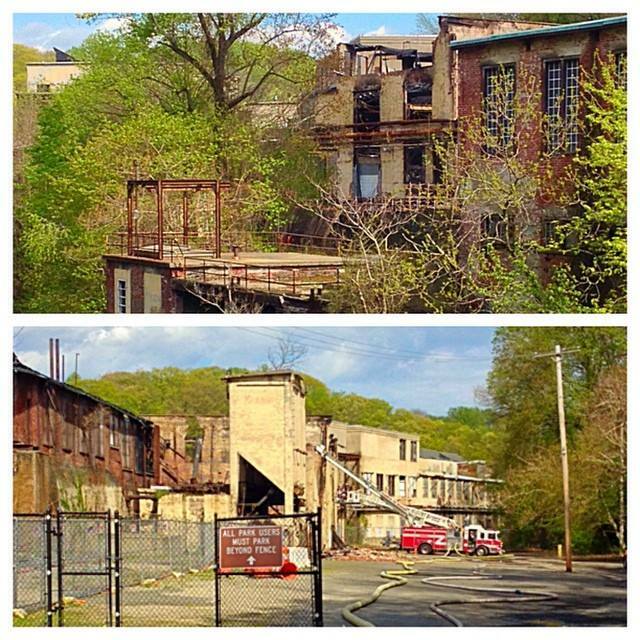 Below is just a sampling of some of the imagery we found from Bancroft Mills. 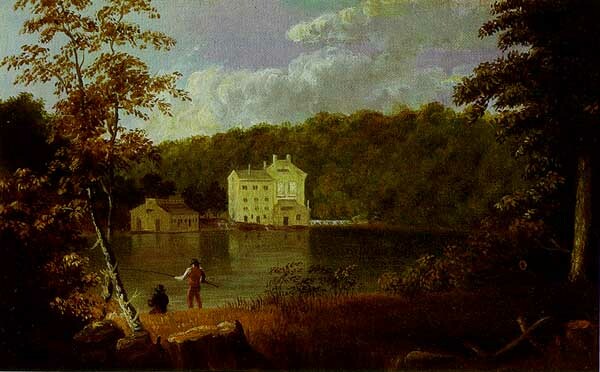 This painting "Gilpin's Mill on the Brandywine" is attributed to artist Thomas Doughty circa 1827. 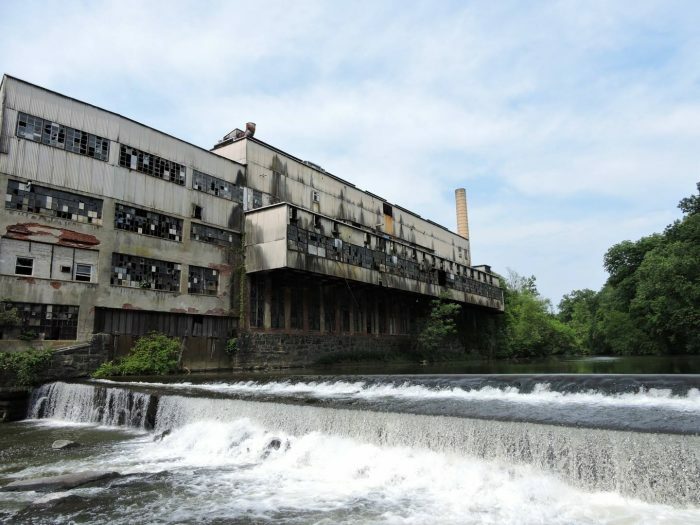 Bancroft Mills as it looked in 2012 on the banks of the Brandywine River. 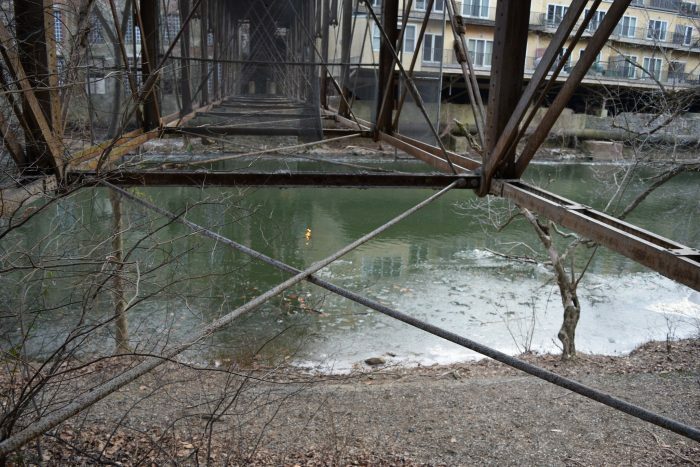 On the left of this photo you can see the remnants of the old, covered pedestrian bridge that used to connect the banks of the Brandywine River. 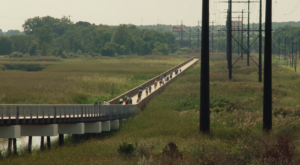 That same pedestrian bridge from the photo above is shown here. Now you know why it's closed! Those who worked at the factory say that this area shows part of the "bleaching room"--where fabrics were made white through a multi-step process. 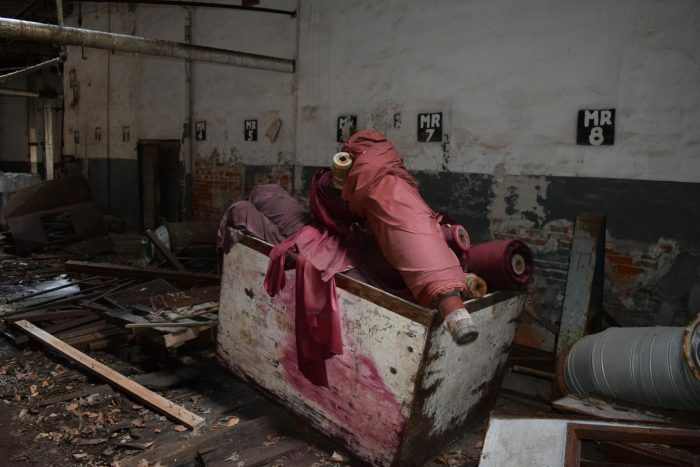 Remnants (literally) of the factory's days as a textile factory still remain. 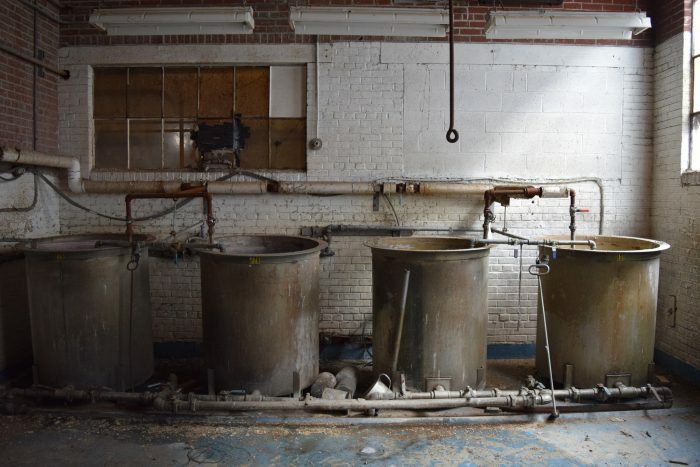 We envision that these tubs were used for either washing or dyeing some of the fabrics. See the spigots in the wall? 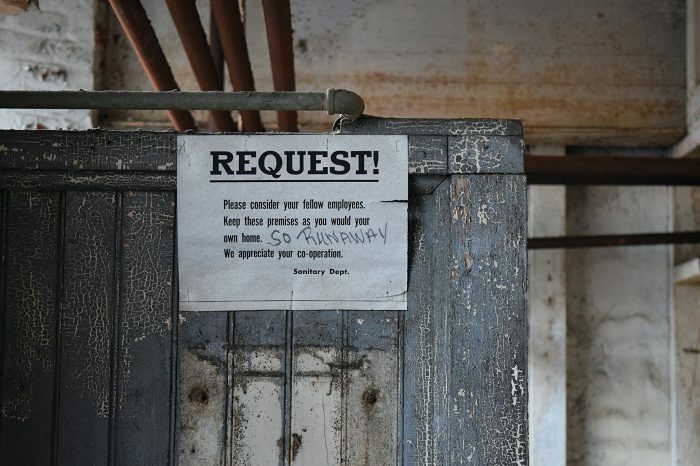 I guess this was the Bancroft Mills version of passive aggressive office notes. 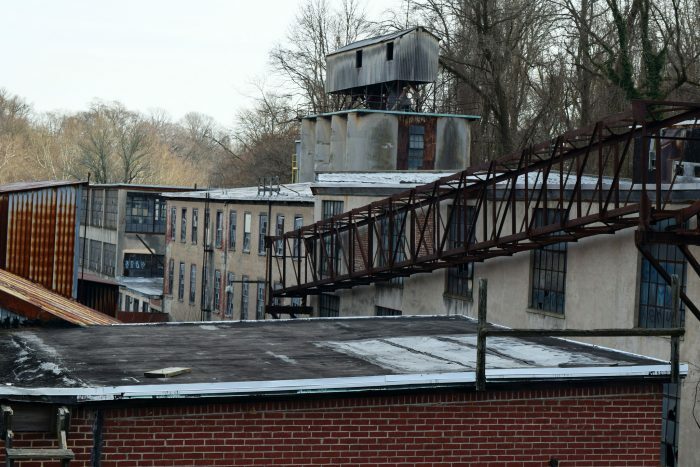 From this angle on a roof, you can see so many different levels of the mill complex which is surely reflective of the way in which it expanded over the years. 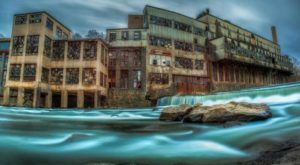 A fire in early May 2015 took the already abandoned, dilapidated mill to another level of disrepair. Shown here are images from the morning after the blaze. 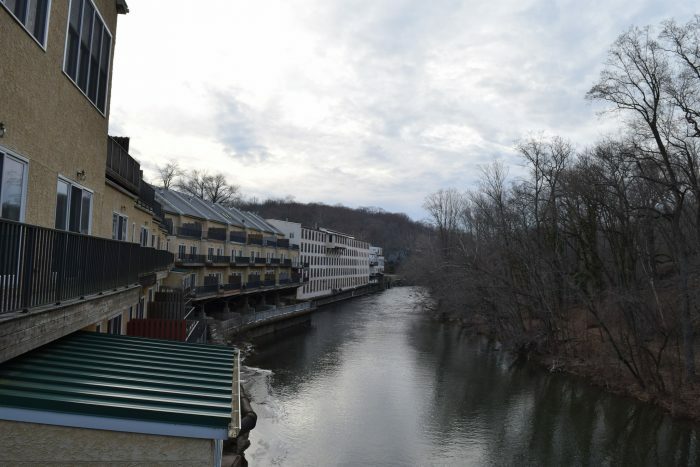 Live in luxury along the banks of the Brandywine in the Bancroft Mills condominiums. 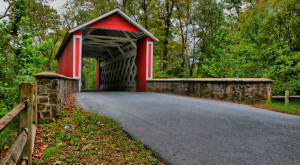 Here's a great vantage point of the Brandywine Creek as it races past the mill. The upstream areas of the mill have been renovated into condominiums, but the lower, downstream section remains abandoned. This more recent photo from March 2016 shows the old footbridge leading to the factory above the falls. 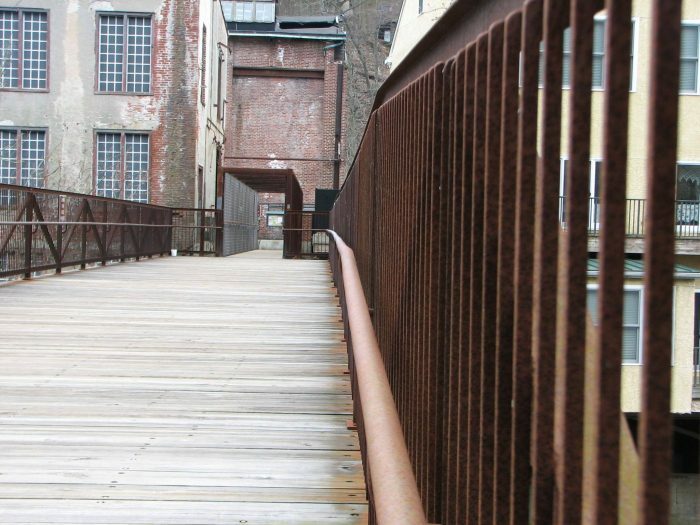 Farther upstream, there's a newer pedestrian bridge that offers some of the best views of the old mill. 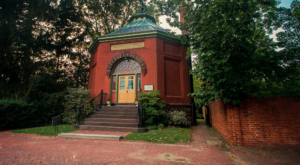 We're still mesmerized by the beauty of this amazing piece of Delaware history. 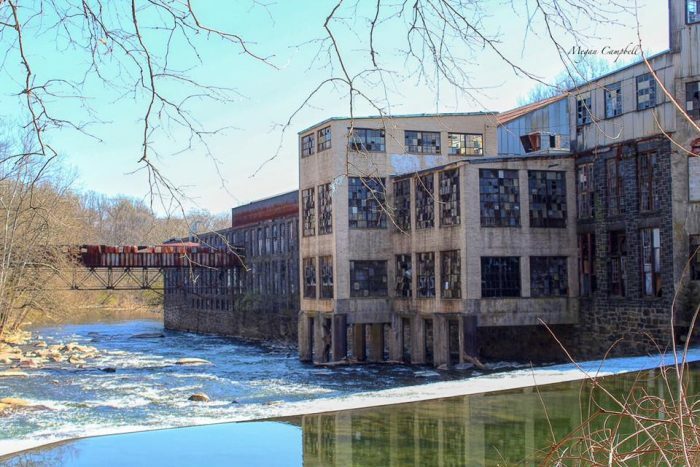 Depending on trail closures and park hours, you can see Bancroft Mills from a distance by walking the trails at Alapocas Run State Park or Rockford Park. Download a map and see for yourself!